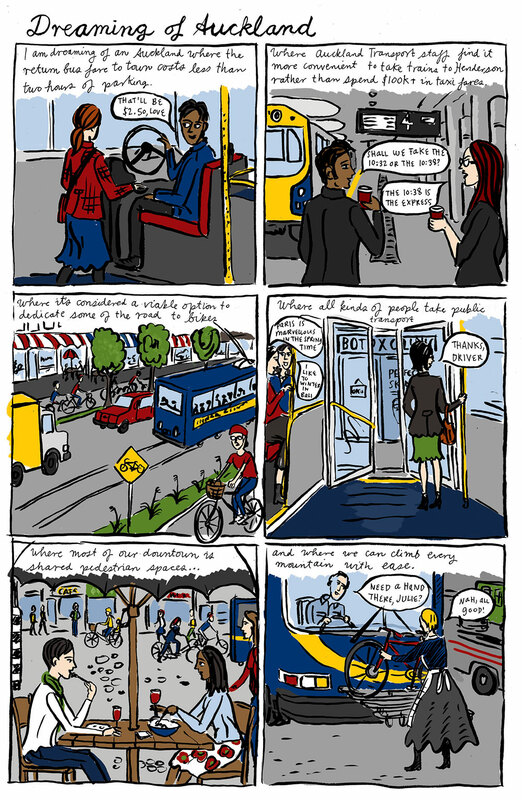 I thought I’d post this Metro comic a bit early because it’s now just a few days out from the election and the central government is not supporting better public transport and bike/pedestrian infrastructure for Auckland – it’s hell-bent on building more super highways so its supporters can speed off to their luxury holiday homes. Which isn’t so great for carbon emissions and climate change. So yeah, I’m sure I’m preaching to the converted, but please vote, and not for the people currently in power. Good spotting – yes it is – she’s climbing every mountain (cue song). Also the sound of music is on in Auckland so she’s already on the back of buses – I thought I’d put her at the front. Thanks! Oh, I will. I will. But will sufficient others do the right thing too? My anxiety level is sky-high! We had a Pashley in our family, now we have an Achielle (Belgium) to go with our Gazelles. Well said and beautifully drawn!